The M1 rifle was named after its Canadian-American designer, John Garand. 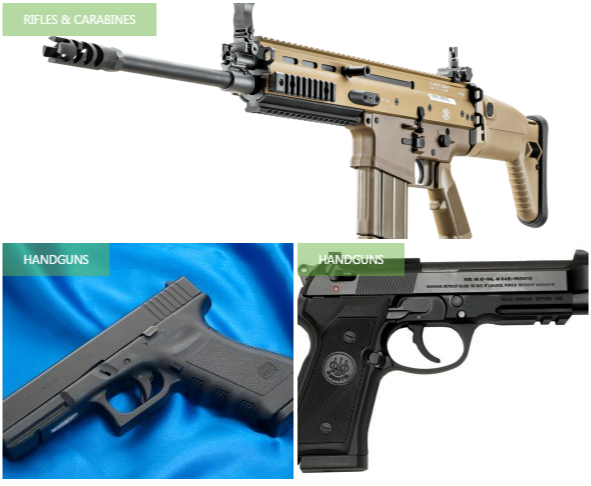 It was the first standard-issue semi-automatic military rifle. By all accounts the M1 rifle served with distinction. 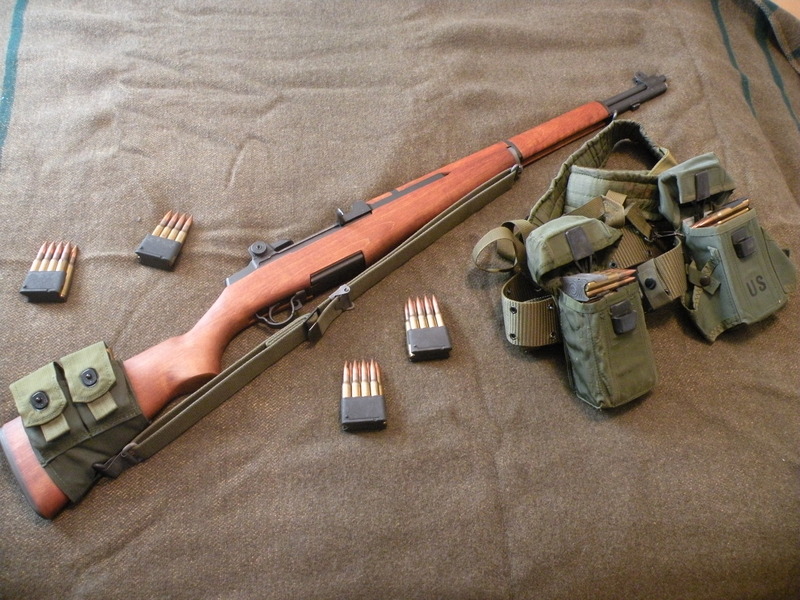 General George S. Patton called it “the greatest battle implement ever devised”.The M1 replaced the bolt action M1903 Springfield as the standard U.S. service rifle in the mid 1930s, and was itself replaced by the selective fire M14 rifle in the early 1960s. Although the name “Garand” is frequently pronounced /ɡəˈrænd/, the preferred pronunciation is /ˈɡærənd/ (to rhyme with errand), according to experts and people who knew John Garand, the weapon’s designer. Most variants of the Garand, save the sniper variants, never saw active duty. The sniper versions were modified to accept scope mounts, and two versions (the M1C, formerly M1E7, and the M1D, formerly M1E8) were produced, although not in significant quantities during World War II. The only difference between the two versions is the mounting system for the telescopic sight. In June 1944, the M1C was adopted as a standard sniper rifle by the U.S. Army to supplement the venerable M1903A4. Wartime production was 7,971 M1Cs. The procedure required to install the M1C-type mounts through drilling/tapping the hardened receiver reduced accuracy by warping the receiver. Improved methods to avoid reduction of accuracy were inefficient in terms of tooling and time. 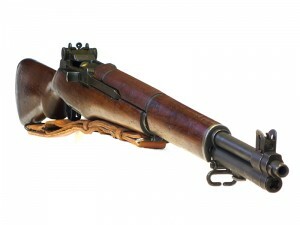 This resulted in the development of the M1D, which utilized a simpler, single-ring Springfield Armory mount attached to the barrel rather than the receiver. The M1C was first widely used during the Korean War. Korean War production was 4,796 M1Cs and 21,380 M1Ds; although few M1Ds were completed in time to see combat. The U.S. Marine Corps adopted the M1C as their official sniper rifle in 1951. This USMC 1952 Sniper’s Rifle or MC52 was an M1C with the commercial Stith Bear Cub scope manufactured by the Kollmorgen Optical Company under the military designation: Telescopic Sight – Model 4XD-USMC. The Kollmorgen scope with a slightly modified Griffin & Howe mount was designated MC-1. The MC52 was also too late to see extensive combat in Korea, but it remained in Marine Corps inventories until replaced by bolt-action rifles during the Vietnam War. 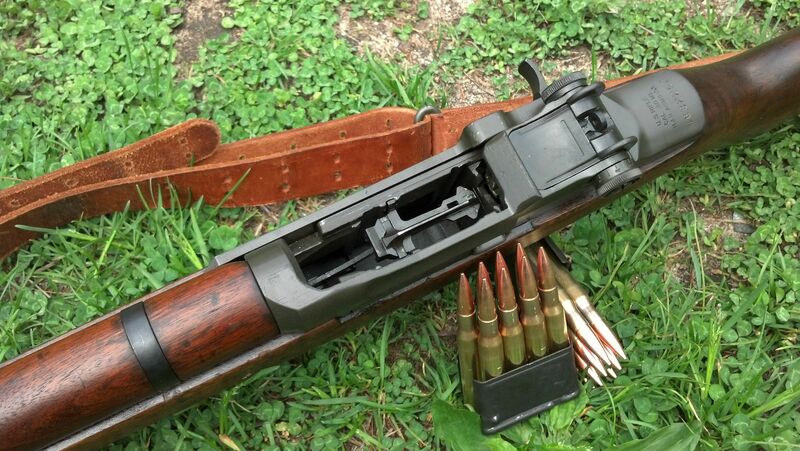 The U.S. Navy has also used the Garand, rechambered for the 7.62×51mm NATO round. The detachable M2 conical flash hider adopted 25 January 1945 slipped over the muzzle and was secured in place by the bayonet lug. A T37 flash hider was developed later. Flash hiders were of limited utility during low-light conditions around dawn and dusk, but were often removed as potentially detrimental to accuracy. Two interesting variants that never saw service were the M1E5 and T26 (popularly known as the Tanker Garand). The M1E5 is equipped with a shorter 18-inch (457 mm) barrel and a folding buttstock, while the T26 uses a shorter 18-inch (457 mm) barrel and a standard buttstock. The Tanker name was also used after the war as a marketing gimmick for commercially modified Garands. The T26 arose from requests by various Army combat commands for a shortened version of the standard M1 rifle for use in jungle or mobile warfare. In July 1945 Col. William Alexander, former staff officer for Gen. Simon Buckner and a new member of the Pacific Warfare Board, requested urgent production of 15,000 carbine-length M1 rifles for use in the Pacific theater. To emphasize the need for rapid action, he requested the Ordnance arm of the U.S. 6th Army in the Philippines to make up 150 18″ barreled M1 rifles for service trials, sending another of the rifles by special courier to U.S. Army Ordnance officials at Aberdeen as a demonstration that the M1 could be easily modified to the new configuration. Although the T26 was never approved for production, at least one 18″ barreled M1 rifle was used in action in the Philippines by troopers in the 503rd Parachute Infantry Regiment (503rd PIR). The T20E2 selective-fire prototype was designed to feed from 20-round BAR magazines. Another variant that never saw duty was the T20E2. It was experimental gas-operated, selective fire rifle with a slightly longer receiver than M1 and modified to accept 20-round Browning Automatic Rifle (BAR) magazines. Bolt has hold open device on rear receiver bridge. Muzzle velocity 2760 fps. Cyclic rate of fire 700 rpm. Select device similar to M14 selector. Full automatic fire was achieved by a connector assembly which was actuated by the operating rod handle. This, in turn, actuated a sear release or trip which, with the trigger held to the rear, disengaged the sear from the hammer lugs immediately after the bolt was locked. When the connector assemble was disengaged, the rifle could only be fired semiautomatically and functioned in a manner similar to the M1 rifle. Machined and tapped on left side of receiver for scope mount. Complete with rifle grenade launcher. Weapon has an overall length of 48 1/4″, a barrel length of 24″, and weighs 9.61 lbs. without accessories and 12.5 lbs. with bipod and empty magazine. Designated as limited procurement in May, 1945. Due to cessation of hostilities with Japan, number for manufacture was reduced to 100. Project was terminated in March 1948.